I have turned my love of history into another genealogy project, tracing the genealogy of all the royal and noble families of Europe. I have traced the major ruling houses of Europe, such as Germany, Great Britain and Austria. Check out my Royal Houses pages to see who is included in my database from the major and minor ruling houses. Here I have listed all countries or regions that had or have monarchies. I link directly to the rulers entry in my database. I have also incorporated any additional noble lines where they intermarry with royalty, such as Princess Diana or the late Queen Mother. To see which Dukes, Marquesses or Earls might be in my database check out the Nobility section. I have been lucky enough to access to some really great peerage books, like The Complete Peerage by Cokayne, Burke's Peerage and Debrett's Peerage. They have been especially helpful in identifying the kissing cousins that crop up in royal and noble houses. 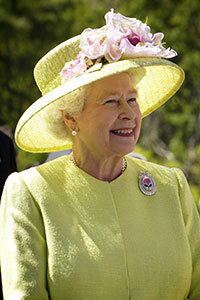 Queen Elizabeth II, aged 81, of the United Kingdom. Photo taken during a visit in NASA's Goddard Space Flight Center in Greenbelt, Maryland, USA.